Grab the wheel and hit the gas! Based on the #1 arcade game, Ivan "Ironman" Stewart's Super Off-Road is an all-out dirt-grinding race. Watch out for the mud holes, jumps and other obstacles on 8 different tracks and 16 configurations. Trade-in cash prizes for racetruck accessories at the Speed Shop and improve your chances for victory. From match-offs to spin-outs, Super Off-Road is as close to genuine short-course racing as you can get. 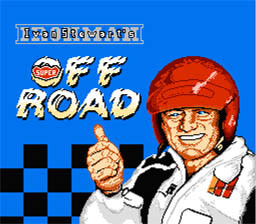 --From the NES Ivan Stewart's Super Off Road instruction manual. Play Ivan Stewart's Super Off Road Now!